Valves are nearly circular in shape and only slightly heteropolar with broadly rounded apices. Valve width ranges from 83% to 97% of valve length and averages 89%. Valve faces are nearly flat with one or two shallow undulations. A distinct axial area and transverse ribs or porcae are absent. 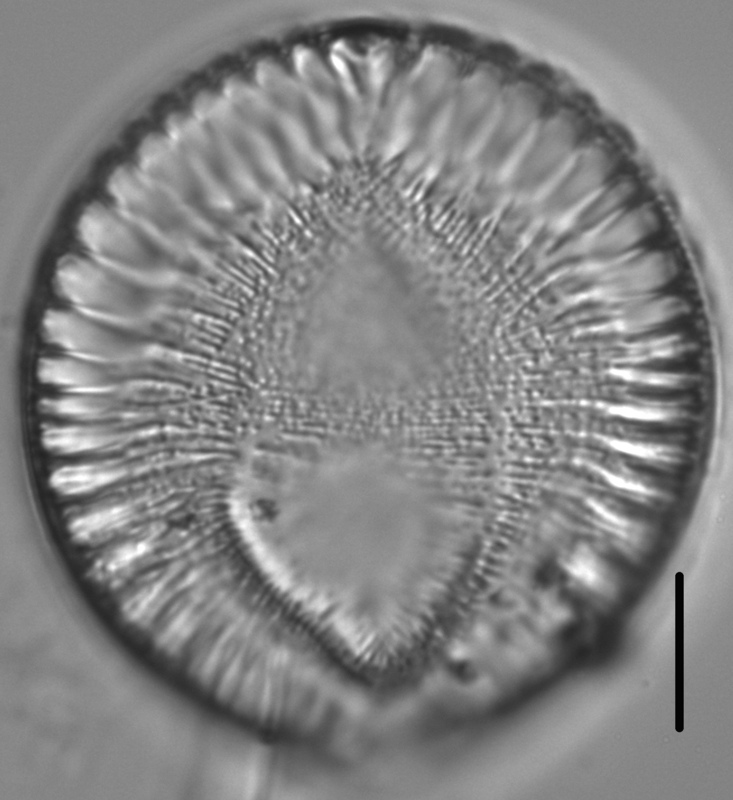 The costae on the valve face number 13-19 in 10 µm. 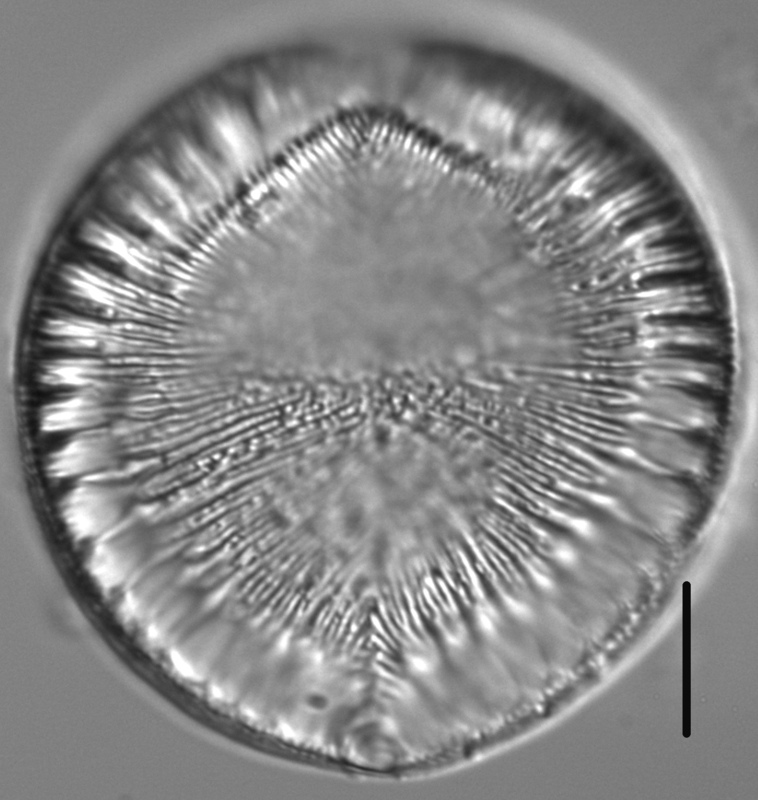 Some costae are thicker and raised above the others where they merge with the fibulae. The marginal fibulae number 3.5-5 in 10 µm. 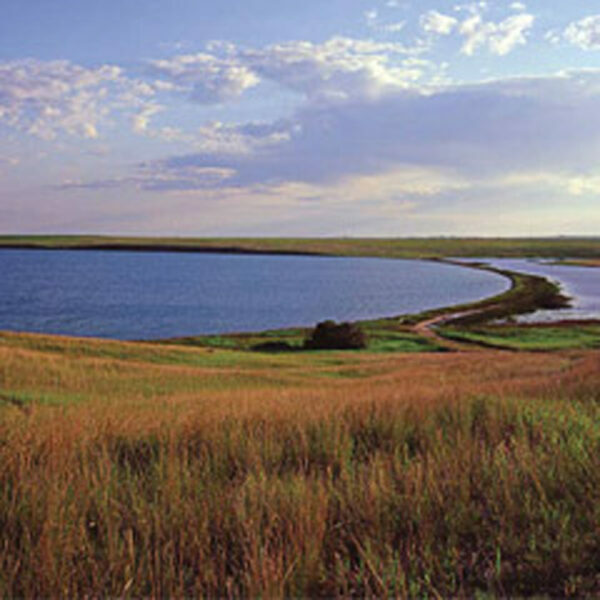 The specimens of Surirella crumena pictured on this website are from Brush Lake, a deep clear lake in the prairie pothole region of northeastern Montana (photos below). On the date of collection, Brush Lake had the following water quality characteristics: conductivity = 5760 µmhos/cm; pH = 9.30; total alkalinity = 1350 mg/L CaCO3; total hardness = 1168 mg/L equivalent CaCO3; Kjeldahl nitrogen = 1.3 mg/L; total phosphorus = 0.018 mg/L; dissolved oxygen = 7.50 mg/L; temperature = 18 C; CO3 = 1070 mg/l; SO4 = 2210 mg/L; Cl = 72.3 mg/L. 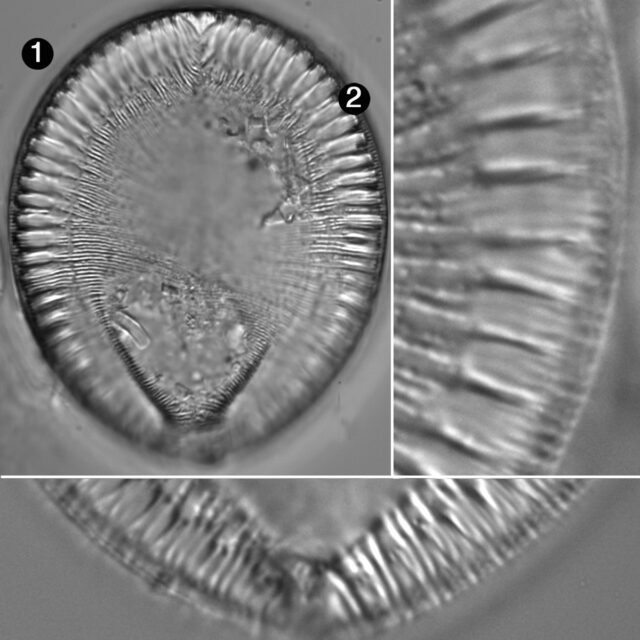 In Brush Lake, S. crumena is part of a remarkable diatom association that includes Scoliopleura peisonis, Staurophora amphioxys, and other brackish-water species that are typical of coastal waters and inland waters of higher conductivity. Witkowski et al. 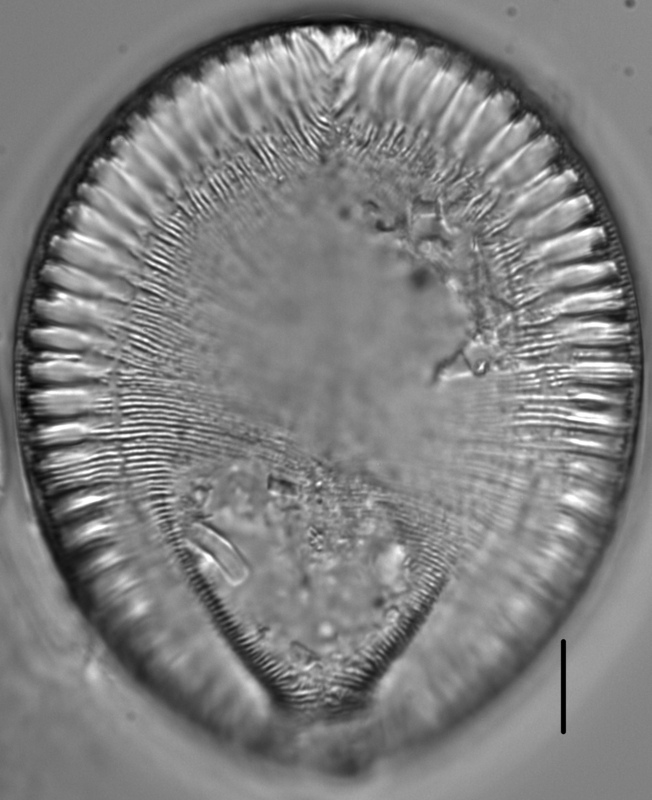 (2000) report S. crumena as "widespread in brackish-waters of the North Sea and Baltic Sea coasts". 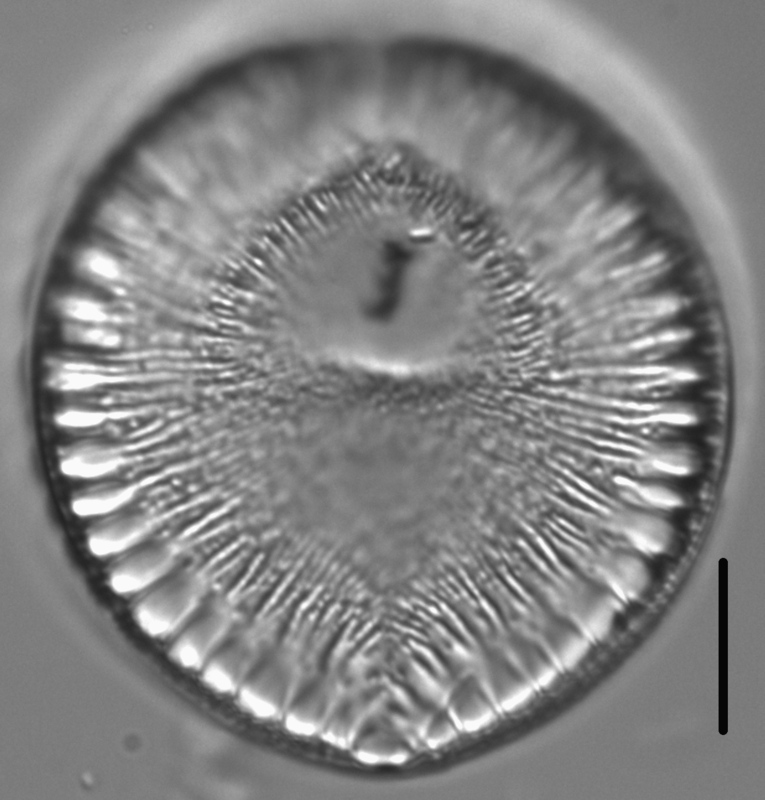 The Brush Lake diatom flora may be a relict of the flora that populated the shallow inland sea that covered much of the Great Plains until about 55 million years ago. 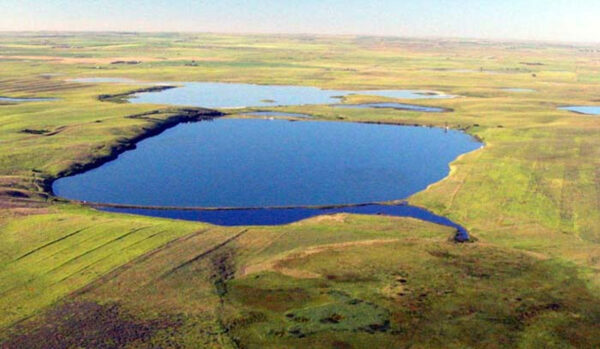 Brush Lake, Sheridan County, Montana: home of Surirella crumena. 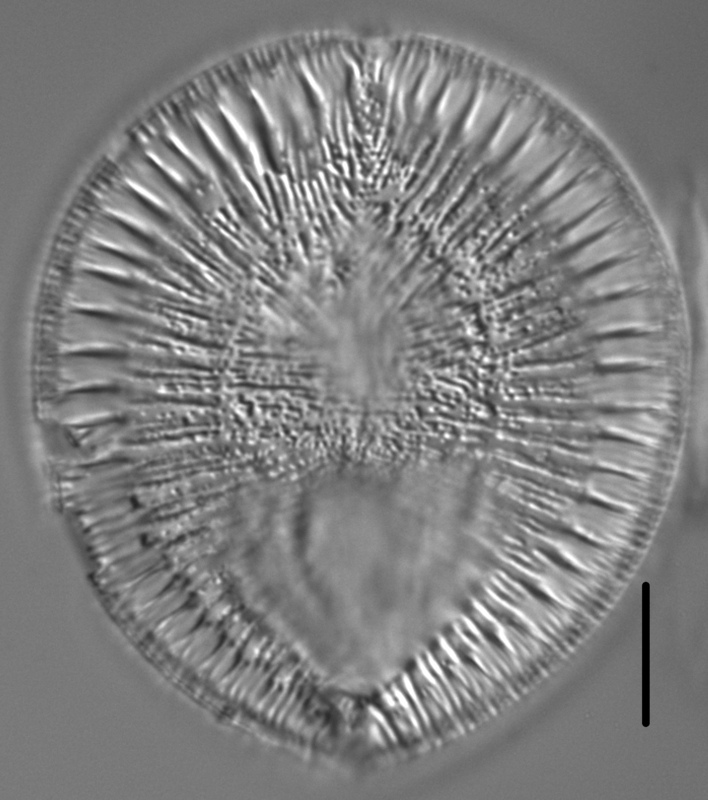 Krammer, K. and Lange-Bertalot, H. (1988) Bacillariophyceae. 2. Teil: Bacillariaceae, Epithemiaceae, Surirellaceae In: Ettl, H., J. Gerloff, H. Heynig and D. Mollenhauer (eds.) Susswasserflora von Mitteleuropa, Band 2/2. Gustav Fisher Verlag, Jena. Valves are nearly circular, with broadly rounded apices. Valves lack a distinct axial area and transverse ribs. Fibulae number 3.5-5 in 10 µm.